Ghana: Ancient Ceremonies, Songs & Dance Music, is a 1979 Elekra Entertainment Explorer Series release recorded by Stephen Jay. Located in West Africa, Ghana as part of an area known as the Gold Coast – rich not only in gold, but regrettably also in slaves, many of whom were brought to America where they shared their musical traditions. According to the liner notes, these recordings were made in the Eastern, Western, and Upper Regions of Ghana in the Brong-Ahafo at festivals, markets, schools, street corners, and other public venues. Rather than a canned performance in a studio, the naturalistic expression of the Ghanaians’ live music captures the essence of the indigenous African sound. Instruments: Voice, donno, mpintintoa, rattle. Performed by a wandering music group in a weekly outdoor market in a remote area of northern Ghana. “The vocal style of this song, with its intricate, overlapping phrases sung in parallel harmonies, is characteristic of northern Ghana” (Ghana). 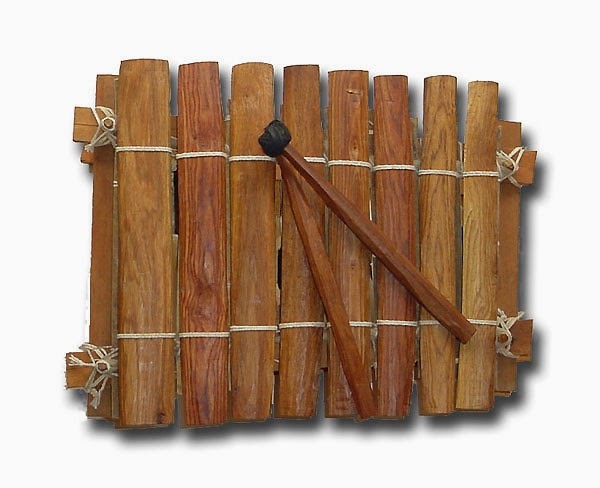 The dzil is also known as the madimba in some parts of Africa, leading some to suggest that it is the ancestor of the South American marimba (Ghana). Performer Adolphus Micah plays the gonje on three songs in this track: “a Christmas song, a song of praise for the chief, and…a war song” (Ghana). Four musicians play donno drums while a fifth keeps a steady rhythm on the gyamadudu. The four donno drummers blend their sound together to create an intricate pattern none could execute alone (Ghana). Recorded at a Ghanaian Independence Day celebration in Navrongo, this performance features a wind and drum ensemble. Gulu drums hold the beat while two groups of wiik players alternate between pitches C and D. Two other groups play the namuna, alternating between pitches E and F (Ghana). The dissonant sound creates an effect somewhat evocative of an African calliope. but the tears are streaming down my cheeks. they also have tears in their eyes. Chorus: Holy Mary is Adam’s grandchild. This performance is noteworthy as it features women drumming in a public performance. Prior to the cultural changes brought on by colonialism, Ghanaian women traditionally did not play the drums, at least in public (Ghana). This recording features a performance of five school boys of the Bulisa tribe entertaining their teacher and fellow schoolmates. Two students play the mpintintoa and three play the wiik (Ghana). One of my favorite pieces on this album, a young girl sings with a unique technique of utilizing a controlled buzzing in the back of the roof of her mouth. This allows her to generate two or three pitches at the same time (Ghana). Another one of my favorites, this recording was done in Nima where the drumming accompanied street dancers. The faint chanting in the background adds a light, lyrical layer to the syncopated rhythm (Ghana). This piece is a quintessential example of indigenous West African percussion. This piece demonstrates melodic improvisations on the donno drum (Ghana). Axatse: A large rattle consisting of a hollow gourd surrounded by a loose net with many small beads or shells attached. Tension of the net is controlled with one hand, while the player shakes the gourd and strikes it against his leg. The rich sound of the axatse, believed to be highly favored by the gods, is closely associated with religious music. Chohun: A xylophone, like the dzil, but slightly larger and with a greater number of tuning keys. Donno: A variable-pitch double-headed drum with an hourglass-shaped body made of wood. Held under the armpit, the donno is struck at one end with a single curved stick. By squeezing the instrument between his arm and his side, a player can produce a wide range of pitches with remarkable control. The donno’s combined melodic and rhythmic capabilities make it an excellent "talking" drum. Dzil: A xylophone consisting of 15 to 18 tuned hardwood keys mounted on a frame made of sticks; an acoustically matched gourd resonator is suspended beneath each key. Over a small hole at the bottom of each resonator is a thin membrane made from spider webs which produce a buzzing timbre when a key is struck. 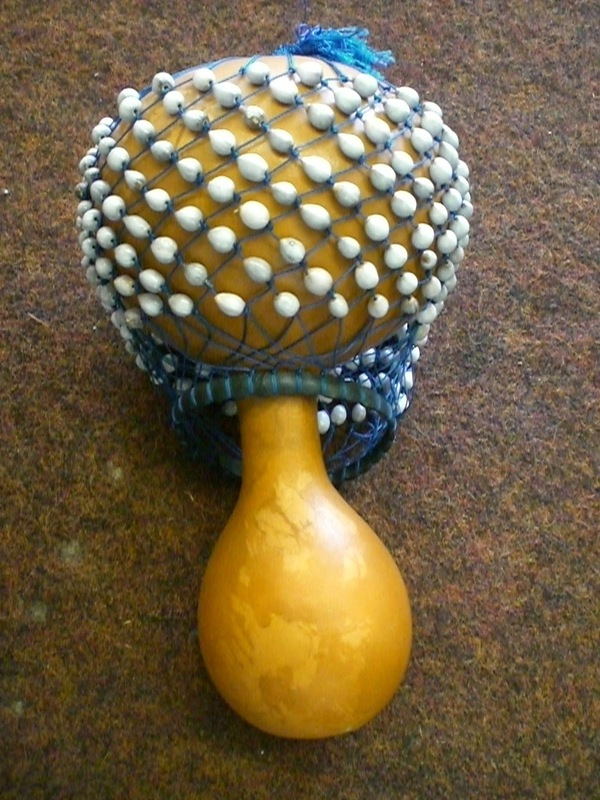 The dzil is played with rubber-tipped wooden mallets. 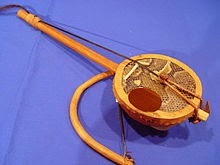 Gonje: A bowed lute with a single string made of horsehair. Its resonator consists of a bowl-shaped section of a calabash, with lizard skin stretched across its open side and a sound-hole cut in the skin. Players stop the string on the side with their fingertips; delicate "pitch bending" on certain notes of a tune is achieved by pulling or pushing on the neck. Gulu: A double-headed cylindrical drum suspended from the shoulder and played either with one hand and a curved stick, or with two curved sticks. 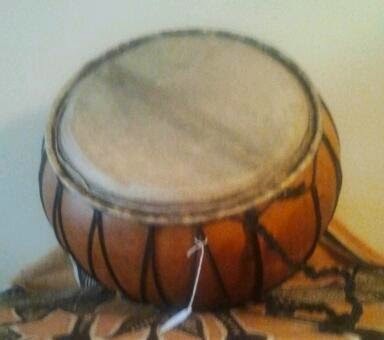 Gyamadudu: A double-headed bass drum with a cylindrical body made of wood. It hangs vertically in front of the legs and is played with one hand and with one heavy, straight stick. Mpintintoa: A single-headed drum made from a large gourd, with goatskin head. The mpintintoa hangs against the player’s chest and is played with both hands. Namuna: A transverse trumpet made of animal horn, with a raised lip surrounding the tone hole. Wiik: An end-blown vertical flute with three finger holes. It is most often used in ensembles of three or more, with the players alternating notes hocket-style to produce a melody. Entertainment, 1979 & 1991. CD. 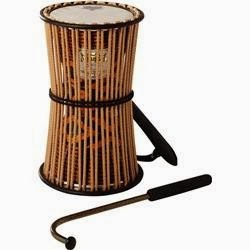 May I ask where can I buy the best Mpintintoa drum? It's so great for me.